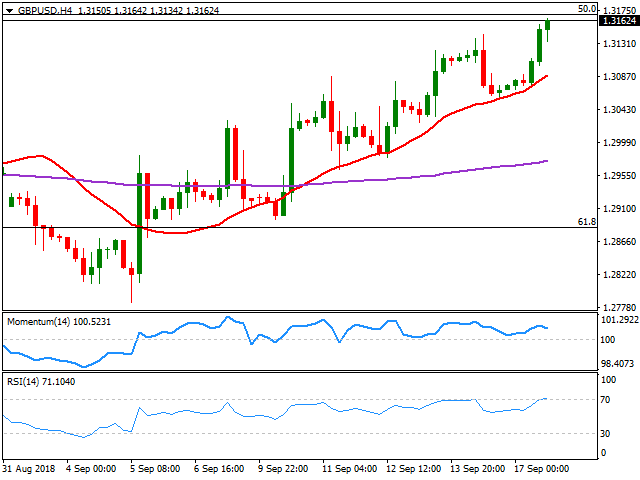 GBP/USD analysis: large stops above 1.3170? UK PM May warns Tories, is Chequers plan, or no-deal. Sterling benefited from investors dumping the greenback on trade war uncertainty. The Pound reached a fresh 6-week high against its American rival at 1.3156, despite some tough comments from UK PM May regarding Brexit. Mrs. May has warned rebel Tories that if they don't support her Brexit plan, the alternative would be a no-deal Brexit. The headlines came after Friday's news indicating that Labour opposition plans to vote against the Chequers' proposal. The EU said that "some parts of the withdrawal agreement have already been agreed in principle, but that's no news: the Irish border issues is still the critical point that the EU and the UK still have to agree. The kingdom's CB Leading Economic Index decreased in July 0.2% to 96.5, but speculative determination to dump the greenback weighed more. The GBP/USD pair broke above its previous 6-week high but held a few pips below the 1.3170 resistance, the 50% retracement of the 2016/18 rally. The 4 hours chart shows that a bullish 20 SMA continues providing intraday dynamic support, currently at 1.3090, also that the RSI indicator lost directional strength after reaching overbought levels, and that the Momentum turns lower, rather indicating pausing buying interest than an upcoming decline, as the price remains at daily highs. Large stops are suspected above the mentioned long-term Fibonacci resistance and could result in a steeper advance if they got triggered. 1.3212, July 26th daily high, is the next possible bullish target.